Does your office space need an infusion of life and energy? Office desk plants are a classic method for improving a workplace environment. Along with looking nice, plants actually have several scientifically supported benefits for indoor spaces. Here are 5 of the incredible benefits that desk plants can bring to your office. Perhaps one of the biggest benefits of desk plants is the potential for stress relief. Several studies have shown that employees in offices with plants have reduced levels of stress, anxiety, and depression. Plants contribute to stress relief in a variety of ways. One way is through color. Cool colors such as green are known to produce a calming effect in the brain. Certain plants also provide aromatherapy. Some species such as lavender or lemon balm give off scents that can relax employees. Working inside an enclosed space like an office is bound to lead to sickness. Pollutants, germs, and other harmful particles in the air can get trapped and continue circulating. Luckily, plants serve as natural air filters. Studies show that plants are great at removing air pollutants. Plants also remove carbon dioxide and replace it with more oxygen. Better air quality means your employees will have to take sick days less often and generally be healthier. A 2015 study showed that natural elements can improve well being by 15%. An office full of plants tends to be a more productive work environment. The stress reduction helps employees concentrate more on their work. The better air quality and improved health means your workers are in the office and doing their jobs more consistently. The lower levels of CO2, higher levels of oxygen, and pops of bright color will also give your employees more energy. With less drowsy eyes and more brain power, your employees can do better work faster. Plants also help to dampen and reduce noise throughout the office. For those who need some peace and quiet to work, plants are a big help. Plants and nature in general, as shown by several studies, can increase the production of new ideas and creativity. Some speculate the creativity boost comes from instincts carried over from the hunter/gatherer stage of humanity, as greenery meant food and shelter. The vibrant color green and some of the other colors seen on flowers and plants might also provide a creative spark. Office plants simply make your office look nice. It brightens a room, adds a pop of color, and shows you care about the design of your office. 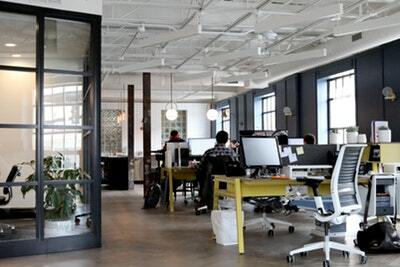 An eye-catching workspace leaves a good impression for visitors. This can include clients and partners, job candidates, and even media members. That means desk plants can help you nail down some extra sales, hire great workers, and maybe get some positive PR. With so many proven benefits, desk plants should be a staple in every office. To learn more about improving your workspace, check out our blog. We’ve heard of offices with sleep pods, ping pong tables, or even beer kegs on tap. It’s a dream to work in a place like that, but we’re not all so lucky. While we’re working towards an awesome office for our employees, we have to make do with a regular office. There’s nothing wrong with that, but there is one big way you could be sabotaging your workforce and not even know it. If you have an office with no windows, you’re doing damage to yourself and your employees. Offices with natural light have tons of benefits, from improving employees’ blood pressure, communication, and more. Once you hear about the benefits of natural light, you’re going to want to change things around. Keep reading to discover how natural life will improve your company. Natural light makes a big difference in people’s life. The simple answer is that it’s an important part of our biology. Almost all organisms have a circadian rhythm. This tells you when to wake up and when to go to sleep. Working in an office with no windows disrupts this natural sense of time. With access to natural light, your employees’ natural rhythm works perfectly. Better sleep leads to more alert, productive employees. Studies have shown that your body’s production of vitamin D has positive effects on your mood. There are a few ways you can get vitamin D. Eating fish, mushrooms, and eggs are a few foods that help stimulate the production of vitamin D. However, the easiest way to stimulate vitamin D production is with sunshine. The natural light exposure from windows or natural lighting lamps will make your employees feel happy to be at work. That’s a big plus! Your employees are sleeping better and they’re feeling happy. Naturally, their alertness will improve. Daylight helps your workers focus up. A bit of sunshine stimulates their creativity, too. Imagine it – no more endless coffee runs or misfired emails. Communication will improve, work will flow, and your company will run like a well-oiled machine. You and your employees are well-rested, happy, and alert. Beyond those benefits, you’ll see a lot of positive physical changes, too. Employees with access to natural light have lower blood pressure. Their BMI numbers improve. With natural light, there’s a decrease in headaches and eye strain brought on by fluorescent lighting and computer screens. What Can You Do If You Work In An Office With No Windows? If you have to work in an office with no windows until you get your dream office, what can you do? 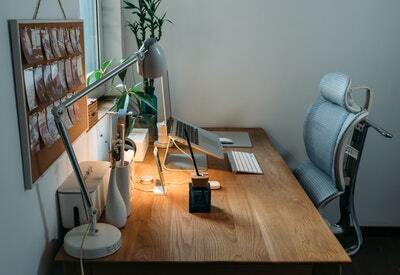 Bring in some natural lighting lamps so that there’s some natural light in the office. Look for an office with similar rent and in a good location that has some windows. If possible, treat your employees to a few healthy office indulgences. It can be anything from a standing desk to painting the walls a more uplifting color. Want some ideas as to what you can do to improve your office? Talk to one of our designers today!